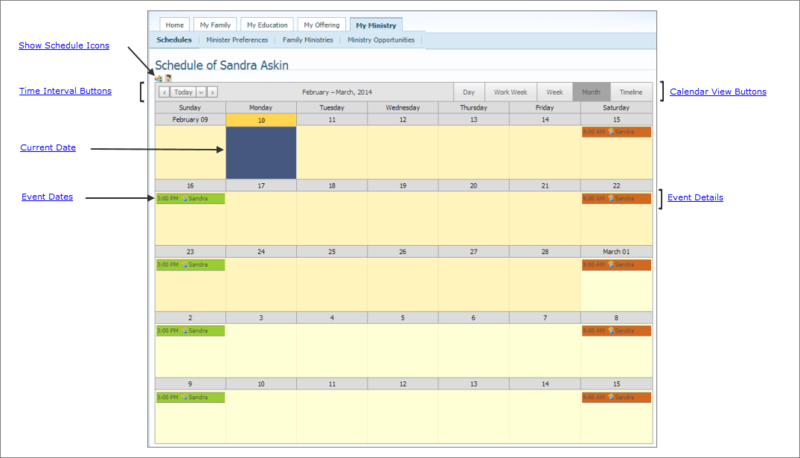 The Schedules page lets you view your family schedule and schedules of individual family members. The Schedules page provides an at-a-glance view of your schedule and your family's ministry schedules. Key elements of the page are identified in the callout links in the illustration below. Place your mouse pointer over a link (without clicking) to view a brief description of the element. For a more detailed description, click the callout link to jump to an explanation later in this topic. switches to the schedule of all family members. switches to the logged-in member's schedule. The current date is highlighted with a maize header, and the entire day is colored blue to make it easy for you to see at-a-glance which day is today. Make sure you select a calendar view button first. These buttons apply to the view you selected. ● (Go Backward): Moves the calendar back by one time interval. 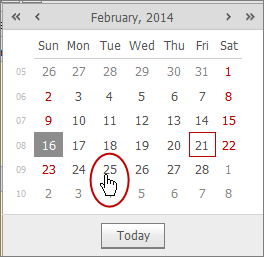 For example, if you select Day and then click , the calendar displays the previous day. If you select, Work Week, and then click , the calendar shows the previous work week. ● (Go Forward): Advances the calendar by one time interval. For example, if you select Day and then click , the calendar displays the next day. If you select, Work Week, and then click , the calendar shows the next work week. ● (Go to Date): click this button to display a calendar, then select the date you want to go to from the calendar. Depending on the calendar view, some of the options shown in this illustration are not available. 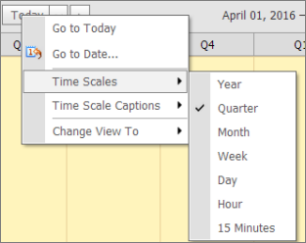 If Timeline is selected, you can select the time scale and specify captions for the time line. Go to This Day: shows you a schedule for today's date in hourly increments. Go to Today: shows you a monthly calendar with today's date highlighted. 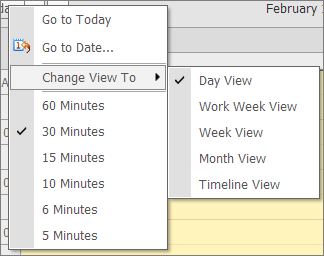 Change the View: lets you change the current calendar view to one of the other viewing options. The currently selected view is checked. 60 Minutes: shows the selected day's schedule in hourly increments. 30 Minutes: shows the selected day's schedule in 30-minute increments. 15 Minutes: shows the selected day's schedule in 15-minute increments. 6 Minutes: shows the selected day's schedule in 6-minute increments. 5 Minutes shows the selected day's schedule in 5-minute increments. ● Day: shows the selected day's schedule in 30-minute (the default) increments. ● Work Week: shows a schedule for the work week only (Monday through Friday). ● Week: shows a schedule for a week (Monday through Sunday). ● Month: (default) shows a schedule for a calendar month (from the first day of one month to the first day of the next month).